Happy Gudi Padwa Everyone. Gudi Padwa is the Marathi New Year and this post is my tribute to the Marathi culture, I was born and raised in. Growing up in a nuclear family setup where both my parents were working professionals, festivals held a great significance in our lives. It was the day, our parents were home and we had such good time over good food and non-stop conversations. We hardly watched TV then. My mom being the best story teller that she is, would tell us all about her childhood memories of the different festivals they celebrated. 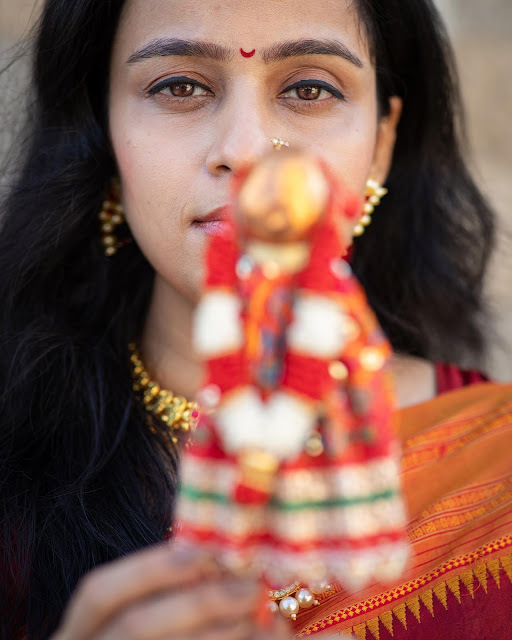 She would tell us, that even though her parents were financially constrained, they made sure that they celebrated festivals with proper traditions. As a little girl, my mom had once asked her mom, why do they incur unnecessary expenditure on festivals when they should be ideally spending it on something more important. And her mom/my Nani had simply replied that it is festivals that enrich our mundane lives. People coming together to celebrate festivals is a way of preserving and enriching our culture. If we don't clebrate it, you as an adult wouldn't celebrate it either and so wouldn't your kids. We don't want to be responsible for killing our culture, customs and traditions. And that's why, no matter how busy or tired my mom was, she made sure we celebrated festivals in the right way and spirit. And that's what I try to do too. 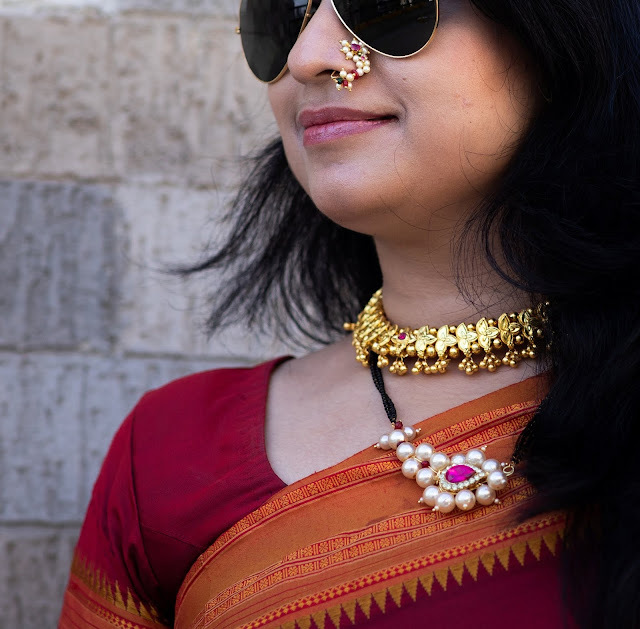 For today's Gudi Padwa special post, I am wearing a Narayan Peth Saree with traditional Maharashtrian jewellery and crescent moon bindi. Narayan Peth Saree is a traditional Maharashtrian saree that is woven mainly in the Solapur district of Maharashtra. Historical records say that the Maratha King Chatrapati Shivaji Maharaj traveled to the Narayan Peth region and camped there for a while. 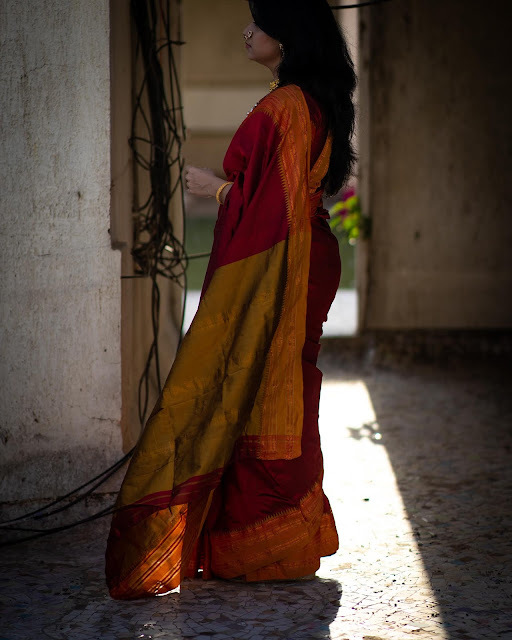 When he continued his journey, some weavers stayed behind and they created the Narayan Peth Saree. Narayan Peth Sarees are light in weight which makes them easy to carry and are inexpensive as well. Hope you like my traditional look. Scroll down for pictures. First time i am hearing this name. Thank you for sharing your valuable information with us.